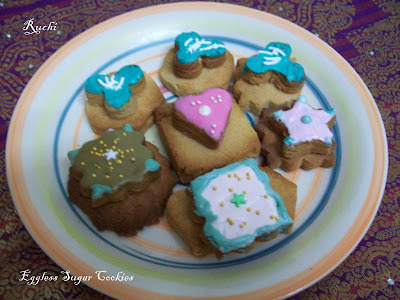 Egg-less sugar cookies with royal icing were on my "to try" list and I wish to bake completely out of eggs and I had always wanted to try royal icing... So while surfing I found an easy recipe for egg less sugar cookies. I finally made them. The result was really good. They’re irresistible! SO soft and their frosting is just so perfect. 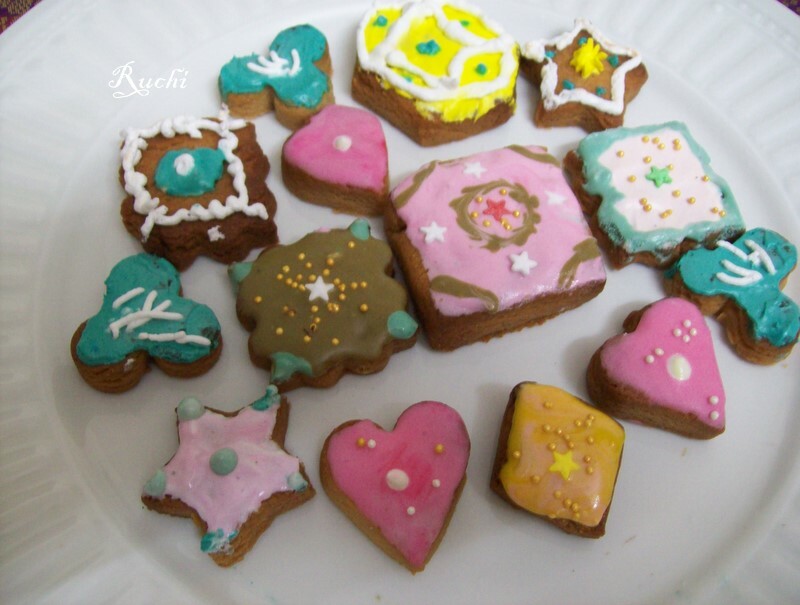 I want to make them again! Baking inspiration comes from everywhere and today my inspiration comes from Aparna. Thank you for such a wonderful recipe! Note: I didn’t change any measurement. I just followed her instruction. 1.Beat the sugar and butter together in a bowl, with a hand mixer, till smooth and fluffy. 2.Add the milk and vanilla and beat until combined. Set aside. 3.In another bowl bowl, sift together the flours, baking powder and salt. Add this to the wet ingredients in batches, and mix well by hand till combined. 4. If the dough isn’t quite coming together, add a tsp or so of milk and knead. Do not be tempted to add too much milk or knead more than necessary to bring the dough into a ball which can be rolled out, as you cookies will become tough. 5.Roll the dough out uniformly till just about 1/4" thick. 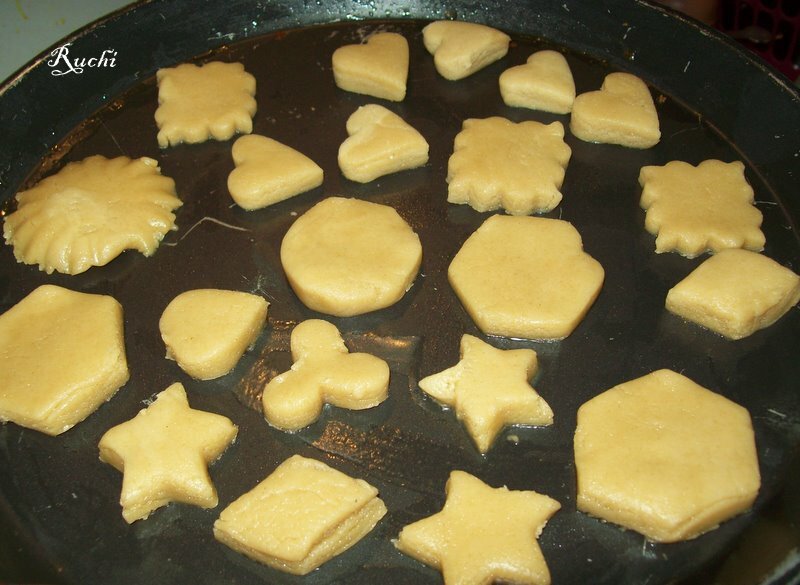 Cut out cookies and place them on ungreased cookie sheets. You can place them quite close to each other as the cookies will not spread out or puff up much. 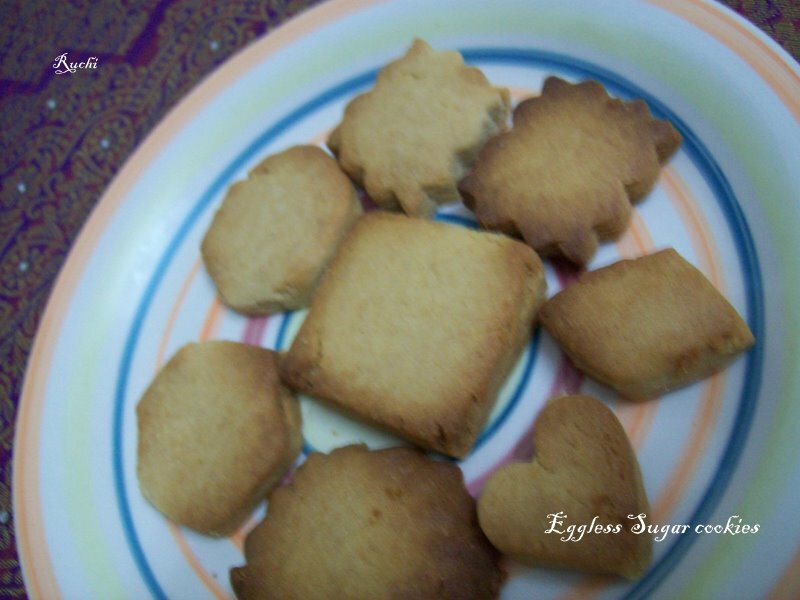 6.Bake them at 180C (350F) for 10 to 20 minutes, depending on the size and thickness of your cookies. 7.When done the cookies must still be pale and just beginning to turn golden at the edges. Let them cool on the tray for about 5 minutes and then cool completely on a rack. 1.Sift the sugar and cornstarch together and put it into a bowl. 2.Add the the lemon juice and the milk, 1 tsp at a time, until the mixture becomes a smooth, but thick paste. 3.Divide the icing into different bowls according to the colours you need. Add a few drops of required colour to each bowl and mix till you get the shade you want. 4.Keep for about 10 minutes till all the air bubbles come to the top. 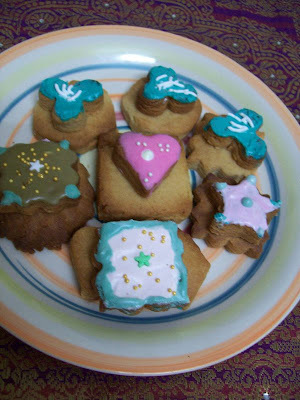 5.The icing will harden if left open so put it into your piping bags and keep ready for use. Woww royal icing with eggs, thanks for sharing..I was searching eggless royal icing since a long..Cookies looks damn pretty Akka..
colourful batch of cookies, akka. i like that icing you've made. I'm happy they've turned out so well and that you liked them too. They look so nice,the icing really is so pretty, especially the colour combo u have used! Wowie !!! Nice colors !!! Keep posting.